News about Rio de Janeiro's architecture and our architecture tours. Neuigkeiten über Architektur in Rio de Janeiro und unsere Architekturführungen. Get our news automatically once a month and subscribe to our newsletter. In 1980, architecture historian Kenneth Frampton published the fundamental book of his area “Modern Architecture: A Critical History”. This title, which was translated into 11 languages, continues to be published. Each edition contains a revision increasing the solidity of his analysis continuously. In the last revision, he is showcasing a less “euro centrical” world, including the Asian, African as well as the Brazilian architecture. In this new edition, he articulates the biggest critique about his work himself, admitting the exclusion of a major part of the world. At the same time, he defends the revision of the analysis to a more complete history, anticipating that one never writes “the” history, but rather from his own point of view. On his research in Brazil, Kenneth Frampton discovered that the first modern building of the country was built by the Russian immigrant Gregori Warchavchik. Le Corbusier arrived in Brazil only ten years later. He was called by Lucio Costa to help him designing the Ministry of Education and Health, which was for a long time considered the first modern building in Brazil. Warchavchik’s house however, was built in 1928. At the time, the architect had argued with the public authorities who did not approve the construction of the building without ornamentation. After finishing the residence, the architect claimed not having the funds for the missing ornaments, which he had added to the approval drawings. The design of the residence, located in São Paulo, follows the five modern principles: rationalism, comfort, utility, cross ventilation and illumination. Today, after an extensive renovation in 2010, the house is open to the public. Besides Warchavchik’s house, Brazil has a remarkable and largely intact heritage of modern architecture. Oscar Niemeyer, Lucio Costa, Affonso Reidy, Lina Bo Bardi and other modern architects, lived in a prosperous era where opportunities were big and numerous. It culminated in the construction of the new capital Brasilia in 1960, today a functioning city with 4 million inhabitants, a must see for every architect. Like Kenneth Frampton, Guiding Architects Rio de Janeiro studies the heritage of Brazilian modern architecture and promotes it in its tours. More than just reading about it, experiencing built space helps to comprehendarchitecture in all its three dimensions. Turn your next vacation into an unforgettable journey to Brazil’s architectural gems and immerse into the welcoming tropical culture too with the professional guidance of Guiding Architects Rio de Janeiro. The glamorous Hotel Nacional, located in the wealthy neighborhood São Conrado, reopens after an extensive renovation, disputing the luxurious hotel market of Rio. After 22 years, the iconic building designed by Oscar Niemeyer resurrects with the Spanish operator group Meliá. In the ‘70s, it attracted people like Liza Minelli, Chet Baker, James Brown and Tom Jobim who stayed at the former Hotel Nacional. So far, the Brazilian top model Gisele Bündchen honored the hotel during a photo shoot with the Italian photographer Mario Testino. The renovation of the listed building had to follow Niemeyer’s concept. The São Paulo based architect Debora Aguiar, maintained the curvilinear language and the open views. Even the lamp of papier mâché by Pedro Corrêa de Araújo, which never left the ceiling hall, was carefully restored. The cylindrical tower with 34 stories obtains 413 rooms and suites with views either to the sea, the forest, or to Rocinha, one of the biggest favelas (slum) of South America. Among the facilities are two restaurants, three bars and an event center. The Gran Meliá Hotel Nacional Rio is the only hotel in Rio with a helicopter landing point. Center piece of the hotel is the lobby, a room of three thousand square meters with absolutely no pillars and only with curved lines. The pillar free structure even holds the roof garden of two thousand square meters, designed by the landscape architect Roberto Burle Marx. The pioneer in Brazilian landscape design is known as the creator of Flamengo Park as well as the pavement design of the Copacabana board walk in Rio de Janeiro. The hotel, originally inaugurated in 1972, was national pride. In its convention center, prestigious events were held and its theatre was platform for festivals such as the Free Jazz Festival. Today, the hotel reopens with the goal to get the Golden Age back to the Marvelous City. After the end of the Paralympic Games, it is time to wrap up in Rio de Janeiro. Some of the stages have already disappeared. "No white elephants" was one of the promises before the Games in Rio. The concept of re-use envisages different scenarios for the stadiums. The beach volleyball arena at Copacabana beach was built as a temporary structure. From this spectacular arena only memories will remain. At least the steep stands impressed with direct views of the beach and Rio’s mountains visitors deeply and cared for sustainable remembrance mainly on social media. At the Olympic Park in the city’s West Zone, only a few stadiums will persist. The Arena Carioca 2 serves as the Brazilian Olympic training center, while the tennis stadium and the velodrome continue to be used for competitive sports, as well as for events and social projects. The handball stadium Arena do Futuro was built on a modular basis to be converted into four schools. The schools will significantly improve the supply of education in the district of Jacarepaguá. The aquatic stadium, also built in so-called nomadic architecture, is dismantled and will provide the structure for two swimming pools on other places. In Deodoro, a neighborhood in the northeast of the city, the canoe channel is already being used as a public swimming pool. For residents of the area this easy reachable pool is a welcomed alternative to the thirty kilometers distant sea. 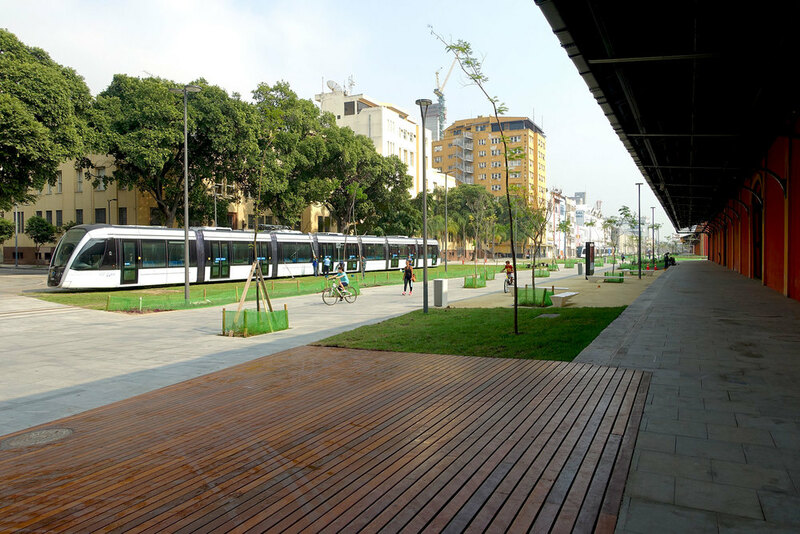 One of the most important legacies is the extension of the metro and the bus system BRT with its own road in Barra da Tijuca. The subway from Ipanema to Barra da Tijuca was completed just in time for the Games. For Cariocas, as the inhabitants Rios are called, it is an veritable experience to reach Barra da Tijuca from Ipanema in 20 minutes. Previously it took a half an hour to up to two hours. The second important legacy is the renewal of the former harbor area. The urban development plan Porto Maravilha replaced the high line along the bay with a tunnel, and improved the infrastructure. For lots in the area, the owner can obtain a higher utilization by paying a fee to the municipality. Finally, the new landmarks such as the Museum of the Future by Santiago Calatrava and the Art Museum of Rio de Janeiro MAR call for attention. Within two years, the abandoned and unsafe quarter turned into an attractive center that attracts tourists and city dwellers alike. For these achievements, the Olympic Games have paid off for Rio de Janeiro to a certain degree. Under the pressure of the world’s attention, projects were implemented that would have been otherwise presumably postponed. On our tours of GA Rio de Janeiro, you will learn more on the urban development plan Porto Maravilha and its implementation. Our guided architectural tours in general are always updated with the latest attractions and information about the current construction activities. Discover Rio de Janeiro, the Marvelous City, through its architecture. Nach dem Ende der Paralympischen Spiele macht man sich in Rio de Janeiro ans Aufräumen. Einige der Stadien sind bereits verschwunden. “Keine weissen Elefanten” war eines der Versprechen vor den Spielen in Rio. Das Konzept für Nachnutzung sieht für die Bauten verschiedene Szenarien vor. Das Beachvolleyballstadion am Strand der Copacabana wurde als temporäre Struktur aufgebaut. Von dieser spektakulären Arena werden nur die Erinnerungen bleiben. Immerhin haben die steilen Tribünen mit direkten Blick auf den Strand und auf Rios Berge die Besucher tief beeindruckt und für ein nachhaltiges Andenken in den Sozialen Medien gesorgt. Vom Olympischen Park in der Westzone Rio de Janeiros bleiben ebenfalls nur wenige Stadien bestehen. Die Arena Carioca 2 wird zum brasilianischen Olympia Trainingszentrum, während das Tennisstadion und das Velodrom weiterhin für den Spitzensport, wie auch für Events und soziale Projekte genutzt werden. Die Arena do Futuro, das quadratische Handballstadion wurde im Baukastenprinzip aufgebaut um nun in vier Schulen umgewandelt zu werden. Die Schulen werden das Angebot an Ausbildung im Quartier Jacarepaguá wesentlich verbessern. Das Schwimmstadion, ebenfalls in sogenannter Nomadenarchitektur gebaut, wird zerlegt und als zwei Schwimmbäder an anderen Orten wieder aufgebaut. In Deodoro, im Nordosten der Stadt, wird der Kanukanal bereits als öffentliches Schwimmbecken genutzt. Für die Bewohner der Gegend ist dieses einfach erreichbare Becken eine willkommene Alternative zur Abkühlung im dreissig Kilometer entfernten Meer. Eines der grössten Legate ist jedoch die Erweiterung der U-Bahn und der Ausbau des Bussystem BRT in Barra da Tijuca mit eigener Fahrbahn. Die Metro von Ipanema nach Barra da Tijuca wurde gerade rechtzeitig für die Spiele fertig. Für Cariocas, so nennen sich die Bewohner Rios, ist es ein wahres Erlebnis in 20 Minuten von Ipanema nach Barra da Tijuca zu gelangen. Bisher benötigte man dafür eine halbe bis zwei Stunden. Das zweite wichtige Legat ist die Aufwertung der ehemaligen Hafengegend. 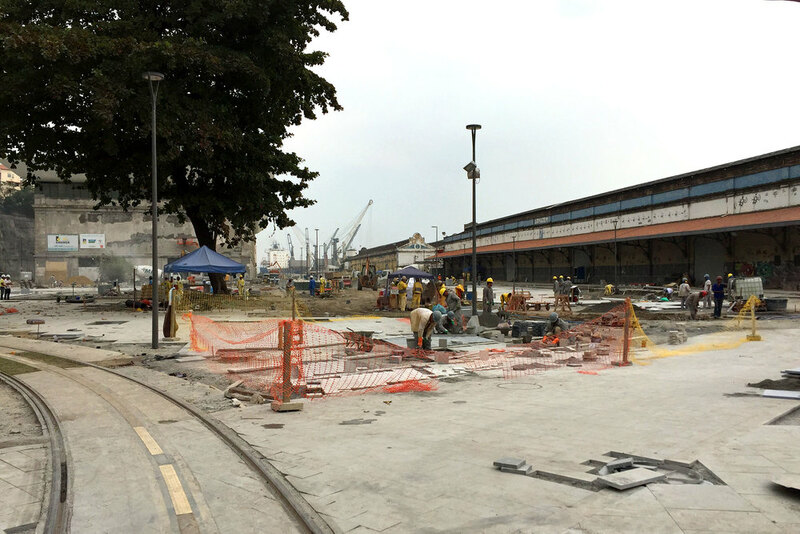 Der Städtebauplan Porto Maravilha ersetzte die Hochstrasse entlang der Bucht durch einen unterirdischen Tunnel, und verbesserte die Infrastruktur. Auf bestimmten Grundstücken kann eine erhöhte Ausnützung gegen eine Prämie gekauft werden. Schliesslich sorgen die neuen Sehenswürdigkeiten, das Museum der Zukunft von Santiago Calatrava und das Kunstmuseum Rio de Janeiro MAR im Quartier für Aufmerksamkeit. Innerhalb zwei Jahren wurde das verlassene und unsichere Quartier zu einem attraktiven Zentrum das Touristen wie Stadtbewohner gleichermassen anzieht. Für diese Errungenschaften haben sich die Olympischen Spiele für Rio de Janeiro ausgezahlt. Unter dem Druck der weltweiten Aufmerksamkeit wurden Projekte realisiert die ansonsten eher aufgeschoben worden wären. Auf unseren Touren von GA Rio de Janeiro erfahren Sie mehr zum dem Städtebauplan Porto Maravilha und dessen Umsetzung. Alle Architekturführungen aktualisieren wir stets mit den neuesten Sehenswürdigkeiten und Informationen zu dem aktuellen Baugeschehen. Entdecken Sie Rio de Janeiro, die wunderbare Stadt, anhand ihrer Architektur. Morgen ist offizieller Beginn der Olympiade, mit der Ankunft der olympischen Fackel. In Rio de Janeiro ist das olympische Fieber bereits seit zwei Wochen merklich am ansteigen. Athleten, Helfer und zusätzliches Sicherheitspersonal strömen durch die Strassen, spezielle Wegweiser wurden angebracht und die letzten Arbeiten laufen auf Hochtouren. Es liegt eine gewisse Nervosität in der Luft und die Stadt liegt im Fokus der Medien. Es wird informiert über Fakten, Gewohnheiten der Cariocas, über Bewohner der Stadt berichtet. Unübersehbar sind vor allem auch negative Berichte über nicht fertig gestellte oder mit Mängeln ausgeführte Bauten, und Kritik an der gesamten Planung der baulichen Eingriffe, die die einkommensschwachen Minderheiten vernachlässigt und die besser bemittelten umwirbt. Die Konstruktionsbranche hat sich nicht mit Kreativität und Qualität profiliert, stattdessen mit Trägheit und Bürokratie brilliert. Man vermisst die Qualität und Innovationskraft, die das Land während der Moderne bereits einmal bewiesen hat. Diese Kritiken schmälern die Vorfreude, mehr als vor der Fussballweltmeisterschaft 2014. Dennoch ist die Chance gross, dass diesmal dasselbe geschieht wie vor zwei Jahren. Mit dem ersten Spiel Brasiliens hat die Freude überhand genommen und die Party dauerte einen Monat. Die Besucher kommen auch diesmal der Wettkämpfe wegen. In den Fernsehübertragungen wird man von den Mängeln wenig mitbekommen. Der Sport steht im Mittelpunkt und die Brasilianer sind unschlagbar, wenn es darum geht, für gute Partystimmung zu sorgen. Die Frage ist, was danach bleibt. Die Stadt hat den Moment verpasst, längst notwendige Verbesserungen nachzuholen. Mit den aktuellen wirtschaftlichen und politischen Krise werden Projekte die die Stadt aufwerten, nach den Spielen wohl erst einmal zurück gestellt. Bis die Stadt wieder weiter gedeihen und die verpassten Chancen aufholen kann, wird es also noch eine Weile dauern. Freuen wir uns also über die erreichten Ziele, ohne die hohe Latte der Erwartungen zu beachten. Der Ökonom und Direktor der Universität FGV Marcelo Neri drückt die Fortschritte in Zahlen aus: zwischen 2008 und 2014 stieg der Lohn der Ärmsten 5% um 29,3% an, der Indikator für Menschen, die unter der Armutsgrenze leben, fiel von 5.71% auf 2.09%, Anstieg der durchschnittlichen Studienjahre von 7.91 auf 8.67 (von 2008 bis 2014). 97,97% der 5–9-jährigen besuchen die Schule, 44.16% der 0–4-jährigen frequentieren den Hort, die Hälfte davon den öffentlichen, was den Müttern erlaubt zu arbeiten und die Familieneinkunft zu verbessern. Als Vorzeigeprojekt mit hochwertiger Architektur profiliert sich das Projekt Porto Maravilha, das mit seinen Wahrzeichen, dem Museum der Zukunft von Santiago Calatrava und dem Kunstmuseum Rio de Janeiro MAR von Bernardes & Jacobsen Architekten, auf dem Platz Mauá viele Besucher anlockt und das historische Zentrum zu einem grossen Teil belebt. In der Nordzone stellt der Freizeitpark Madureira von Ruy Rezende Architekten, der auf einem Gebiet, das von der Elektrizitätsgesellschaft Light freigegeben wurde, für die dortigen Bewohner einen massiven Gewinn an Lebensqualität dar. Der grösste Skatepark, Fahrradwege und Planschmöglichkeiten für die Kleinen bieten ein Paradies für die jüngeren Generationen. Wie die bis jetzt nicht öffentlich zugänglichen olympische Park und das Athletenquartier sich auf ihre Quartiere auswirken, wird sich nach den Spielen zeigen. Vielversprechend tönen die Projekte der Arenen die danach andernorts als Schulen oder Sporthallen wieder aufgebaut werden sollen. Wir sind gespannt auf deren Umbau und die Umnutzung der olympischen Pärke und der Olympic City. Bis dahin lassen wir uns von den sportlichen Höchstleistungen inspirieren. Am architektonischen Geschehen bleiben wir dran. Tomorrow is the official start of the Olympics, with the arrival of the Olympic torch. In Rio de Janeiro, the Olympic fever has been rising significantly already in the last weeks before. Athletes, volunteers and additional security personnel passing through the streets, special signs were mounted and the final construction works were in full swing. There is a certain nervousness in the air and the city is in the media spotlight. Last minute information for visitors about the country and city, how to behave in Rio in order not to be recognised as a “gringo”. Highly visible were also negative reports about unfinished buildings, or lack of quality, and criticism of the entire programming of structural measures, which benefits more the wealthy than the lower classes. It is true, that the Brazilian construction industry has not profiled with creativity and quality, instead shines with inertia and bureaucracy. One misses the quality and innovation that Brazil already had proved once during modernity. These reviews diminish the anticipation, more than before the Football World Cup 2014. However, the chance is great that this time the same thing happens as two years ago. With the first moments of the game of Brazil the party started and lasted for a month. Also now, the visitors come for the competition. In the television broadcasts you won’t notice the many deficiencies. The sport is the focus and the Brazilians are unbeatable when it comes to ensuring good party mood. The question is what remains after that. The city has missed the moment, to catch up with necessary improvements. With the current economic and political crisis projects will enhance the city, well placed only once after the games back. Until the city prosper again on and catch up the missed opportunities, so it will take a while. Thinking positively, we are delighted with the goals achieved, without considering the high bar of expectations. The economist and director of the University FGV Marcelo Neri pushes the progress in figures: 2008-2014 the wages of poor rose 5% to 29.3% on the indicator of people living below the poverty line, fell from 5.71% to 2:09%, increase in the average years of study of 7.91 to 8.67 (from 2008 to 2014). 97.97% of 5 - 9 years attend school, 44.16% of 0- 4 years haunting the hoard, half of them public, which the mothers allowed to work and to improve fixed income. The flagship project with high-quality architecture is the urban renewal of the harbour area, Porto Maravilha. Its landmarks, the museum of the future by Santiago Calatrava and the Art Museum of Rio de Janeiro MAR of Bernardes & Jacobsen Architects, attract hundreds of visitors each day. The formerly abandoned square Praça Mauá and the historic center profiled are now largely animated, even in the weekends. In the north zone, the amusement park Madureira by Ruy Rezende architect represents a massive gain in quality of life for the local residents. The biggest skate park, bike paths and water basins for children are a paradise for the younger generations. The park was built on an area that has been released by the electricity company Light. The impact of the Olympic Park and Athletes Villa on their quarters will be revealed only after the games. The idea to convert some of the arenas to schools or sports halls sounds promising. We look forward to their conversion and the moment when the Olympic Parks will be open to the public. Until then, we’ll draw inspiration from the athletic performances. We stay tuned on what happens in architecture. Just before hosting the Olympic Games, Brazil has conquered another important title: the architecture complex Pampulha in Belo Horizonte was nominated World Heritage Site by the Unesco this Sunday, July 17th, in Istanbul. It is the 20th site in Brazil to receive this title. Built in the 40's, the four pavilions around the artificial lake Pampulha in Belo Horizonte are a very early product of the Brazilian modern movement. For the church, the casino, the ball room and the yacht club Oscar Niemeyer worked together with artist Candido Portinari and landscape architect Roberto Burle Marx, like he did in many following projects. In order to receive the title, Pampulha had to come up with a new management plan ensuring the maintenance and preservation of the complex. It is important, that this early product of the Brazilian modern movement is accessible to the humanity. Visit Pampulha and join us for the trip to Belo Horizonte and Inhotim in collaboration with DRP Kulturtour in March 2017. In collaboration with DRP Kulturtour we offer a trip to Belo Horizonte and Inhotim. Besides profound information about the visited projects you will get professional advice for your photography from Michael Marczok, professional photographer. Thereby, the unforgettable trip will be equally memorable through your exceptional pictures. The revitalisation of the former harbour area is only one of many projects related to the Olympics. After the demolition of the high line "Perimetral", along the coast of the bay the former abandoned area around it has become a place for pedestrians, bikers skaters. The neighbourhood's benefit is a better infrastructure and a wide offer of cultural activities. The electric tramway VLT connecting the port area to the national airport was inaugurated recently. Until end of July you can join a ride for free! Due to the success of the trip we did in May, we decided to do another architecture trip through Brazil in November this year. The program is coming soon. Dates of the trip 18th to 27th November, tours will be held in German. Find more information here. On our trip through Brazil we visited three cities listed as UNESCO World Heritage Site. Rio de Janeiro is beautifully settled between mountains and the sea, while Ouro Preto received the certificate for its intact town center in baroque architecture. Brasilia, on the other hand, was built according modern principles by Lucio Costa, and packed with iconic architecture pieces by Oscar Niemeyer. Besides the well known landmarks from colonial to modern times we also visited contemporary architecture. In Brasilia the local office Bloco Arquitetos showed us a single family house outside Costa’s Plano Piloto and referred about the issues of contemporary urban planning in Brasilia. At the visit to Bruno Campos’ beautifully renovated house in Ouro Preto we had a deeper insight to planning and construction issues with listed buildings. The visit at Center for Contemporary Art Inhotim with its unique architecture was also a great opportunity to enjoy the landscape. Last but not least, we explored the impact of the Olympic Games on the city of Rio de Janeiro. Read the trip report by Torsten Stern from a-tour Hamburg (in German only). Beginning of this month, GA Rio de Janeiro attended the annual meeting of the Guiding Architects Network in Santiago de Compostela and was officially accepted as a new member. Santiago de Chile is the second destination from Latin America to join the network. With the other new destinations from Europe that have joined the network - Glasgow, Nantes, Stuttgart and Venice - the network now provides professional architecture tours in 51 destinations worldwide. Besides training workshops for the guides and exchange of experiences we enjoyed guided tours by our colleagues from GA Santiago. Even the rain could not stop us! We're glad to announce that the 10-day-trip to Rio de Janeiro, Brasilia & Belo Horizonte will take place. There are still few places left. Reserve your seat today! In preparation to the Olympic Games 2016 the city has launched several urban reform plans and infrastructural projects. Public transport was expanded, electric infrastructure and sewage system was improved in abandoned areas and the pacification of the favelas was only the start of a new political strategy regarding these informal settlements. Besides that new landmarks arose on strategic locations in order to attract a diverse public. Two examples are the Museum of Arts Rio de Janeiro MAR by Bernardes Architects, inaugurated 2013, and the Museum of the Future by Santiago Calatrava, which opened to the public on December 19th. Join us for the tour Urban Design Today and learn more about the impact of the mass sport events on the city. We're proud to announce that GA Rio de Janeiro will be member of the international organisation Guiding Architects Network. Members of this network provide professional guided architectural tours in destinations in Europe, Australia, Asia and North America. Rio de Janeiro Brazil is the first destination offering the same quality tours in South America! Here is more information about the Guiding Architects Network.